Lenovo defends its claim to the top spot. Whether you're purchasing a $1,500 gaming laptop or a $200 Chromebook, the brand matters. 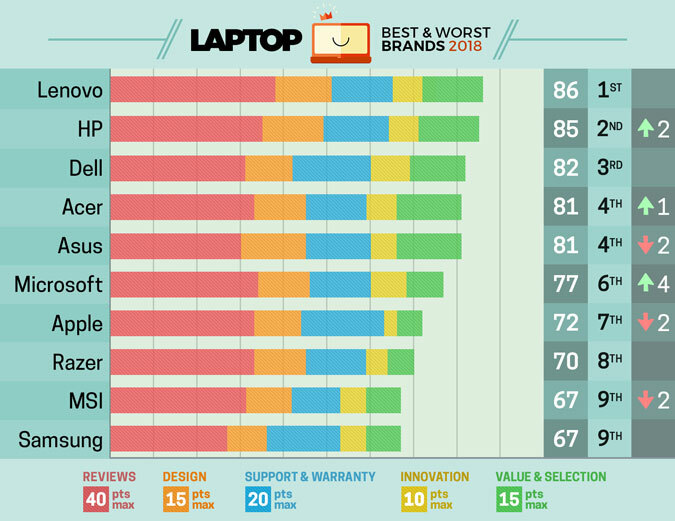 That's why we rate the top 10 laptop brands each year, based on their support, design, innovation, value/selection and, most of all, product quality. Oh, how the mighty have fallen! Apple just doesn't seem as focused on its laptop business as it used to be. The company did nothing to innovate or even tweak its designs in the past year, and only one of the company's laptops earned an Editors' Choice award. However, Tim Cook's company still has the best tech support you can get. Design (15 points): We absolutely will judge a notebook by its cover â€" and its sides, deck, bezel and base. Though no two notebooks look exactly the same, each brand has a design language that cuts across its product lines.